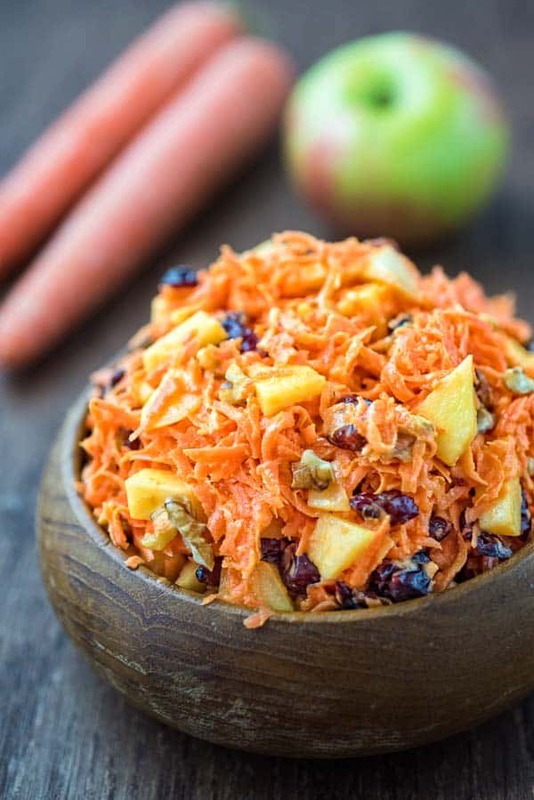 This easy-to-make, flavorful, and healthy Shredded Carrot Salad — packed with cranberries, apples, and toasted walnuts — is loved by both kids and adults! 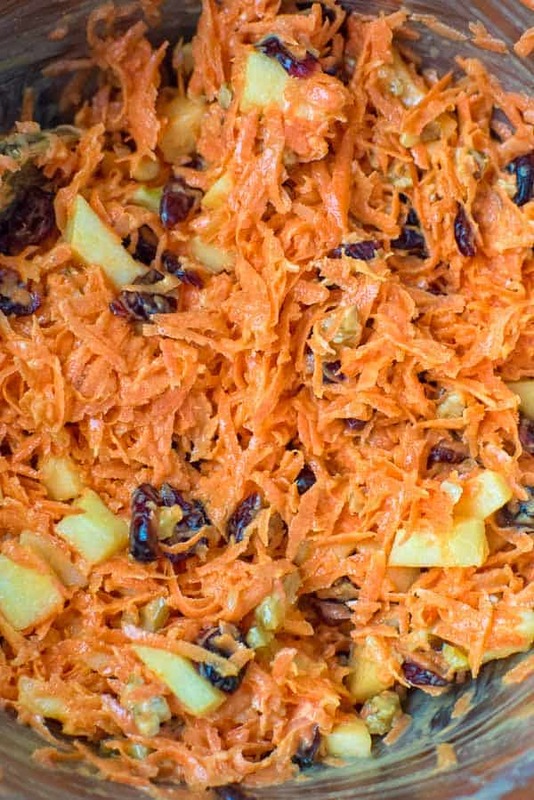 Shredded Carrot Salad is one of those meals that every housewife needs to know how to make. This incredibly tasty, simple, and vitamin-loaded treat makes a great addition to anyone’s diet. 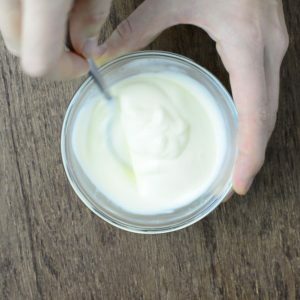 Below, I’ll show you how to prepare it, as well as give you a few tips and tricks that go into making it right. Let’s start with some tips. First, you’ll want to use really good carrots (duh!). Unfortunately, not all carrots are created equally – some taste sweet and fresh, some are lacking flavor, and some are downright bitter. I usually purchase Organic Carrots from the local Walmart. They only cost about a dollar more, and they always taste great. Just look around your grocery store; you may find that organic carrots are not that expensive. Second, don’t skip the apples. Besides their well-known health benefits, apples add a wonderful flavor and a nice crunch to the salad. I find that Honeycrisp, Pink Lady, and Gala apples work best in this recipe. As far as the rest of the ingredients, you can customize them to your liking. Today, I am trying it with cranberries and toasted walnuts. 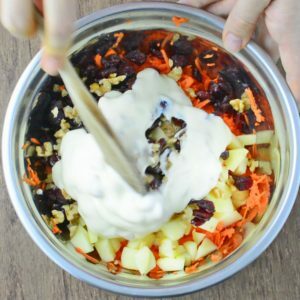 Just place all of the ingredients in a small bowl and mix well. 1. Place the salad ingredients into a large mixing bowl. Pour the dressing on top. Mix everything together. Yes, you are all done! How to shred the carrots. Use a food processor with a special attachment, or a regular grater, to shred the carrots. You may julienne the carrots as well, although I prefer the shredded texture. Substitutions. Feel free to substitute cranberries with raisins, or even diced pineapple. You may also substitute walnuts with toasted almonds, pecans, or skip the nuts altogether. Storing Shredded Carrot Salad. Unfortunately, this salad doesn’t stay well in the refrigerator. I recommend making just enough so that you won’t have any leftovers. 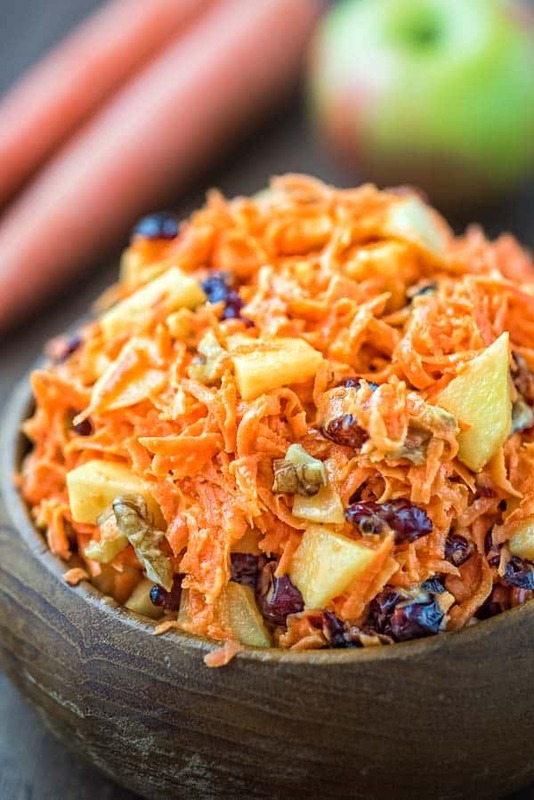 Enjoy your yummy Shredded Carrot Salad with Cranberries, friends! 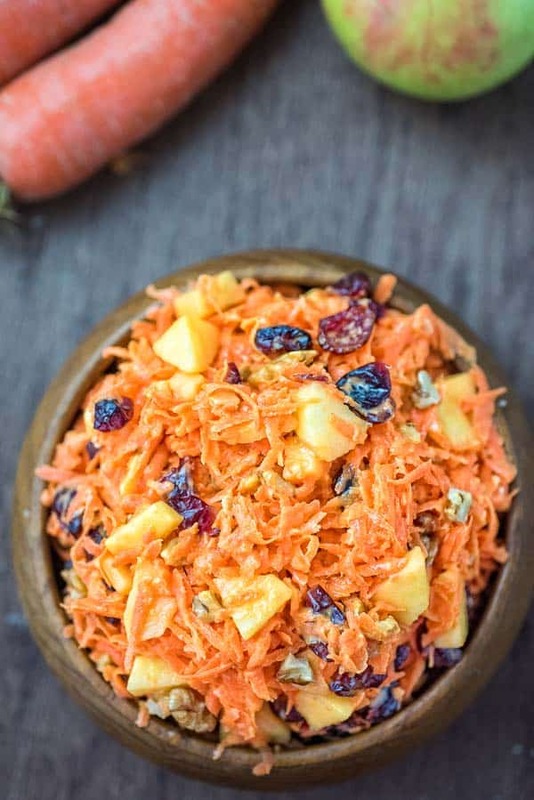 This easy to make, flavorful and healthy Shredded Carrot Salad, packed with cranberries, apples and toasted walnuts is loved by kids and adults! Just place all of the dressing ingredients in a small bowl and mix well. Place the salad ingredients into a large mixing bowl. Pour the dressing on top. Mix everything together. THANK YOU SO MUCH, for your feedback, Rosa! I am so glad to know you enjoyed this salad! Every house husband should know how to make this, too!